As in the previous post, these are Foundry figures and Elite guns. 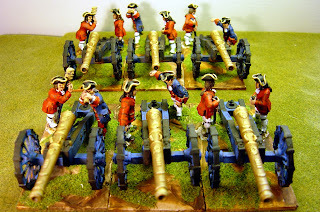 Note that I have used different blues for the guns on the basis that there was very little standardisation in this period. As for the painting of the gun barrels I have used the Foundry Triad 36A-B-C which is supposed to be various shades of gold. The 'A' is almost a bronze and works well as the base coat. Then I touch up the detailing with 'B' followed, when dry, with just a sparing amount of 'C'. The final covering is a dirty acrylic matt varnish. On that subject I have stopped using Armypainter as I was wasting so much. The tins are very hard to keep sealed as they are such a tight fit. This new 'dirty varnish' is just an ordinary bottle of artist's matt acyrilic varnish with a added 'rust' paint (from Coat d'Arms 241 Rust) and it works just as well. 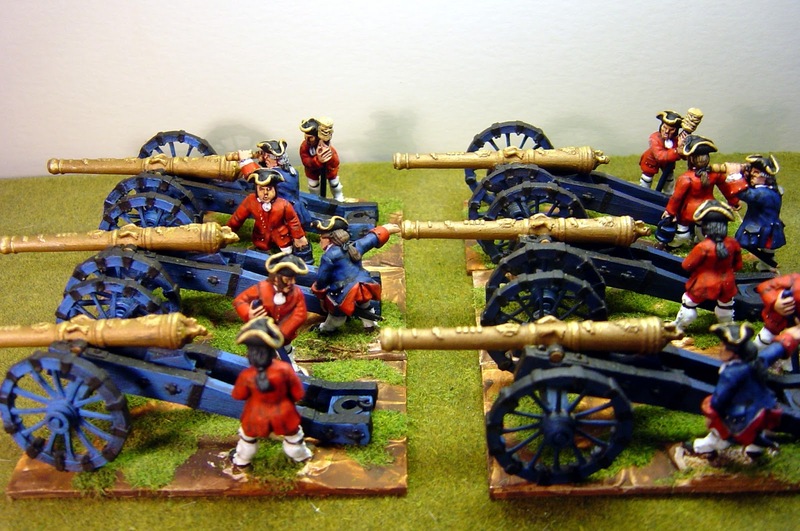 Great looking, and very impressive, artillery! 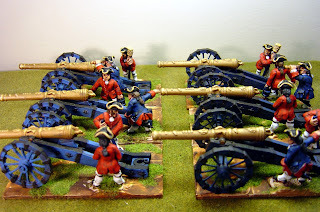 I just painted my first SYW French gun from Elite and you are right, they are wonderful castings. The crew are not too bad either. Just need a few more of them.